Hey guys! Over the next few weeks we are going to be migrating a series of development journal posts from the Patreon private activity feed over to here. If you're interested in seeing content early you should consider making a pledge! Don't worry about missing out on important news though, announcements will be made here as well! Hello everyone, and welcome to the first Malise and the Machine development journal post! Over the past few days I was generating a list of topics that I'd like to go into more detail about; I then threw out the list and decided to start off with a simple post, with some sample concept art showing off a bit of the good stuff. A goal of the H-system in the game is to provide a highly dynamic experience by way of unique artwork for various combinations of status effects. These status effects include all sorts of unfortunate situations our protagonists will find themselves in. Another design component of the H-system is that many effects persist beyond battle. This means that by the end of each foray into the less hospitable areas of the game, your characters will likely be a mess in all sorts of ways! The featured artwork also provides a rather unceremonious formal introduction to one of the protagonists: Malise. Expect a post in the future detailing her and other characters' background stories... but for now, stickiness! Will we be seeing any girls other than the protagonists? Also this is very inovative idea and i like it! Yep! 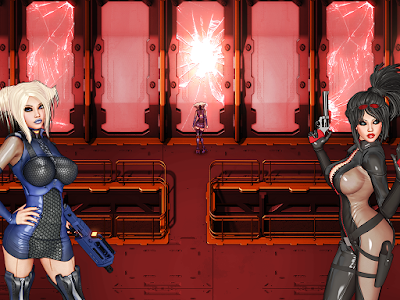 At least one of the major antagonists is female, and there will be female enemies as well. I'm still messing around with design ideas for them though as most of the work is going into getting the core mechanics and necessary art ready for the first Patreon release. are the h scenes going to reflect any different outfits. Yeah! That's one of the main focuses of the H system actually. All artwork will have different versions based on the outfit the character is wearing. Outfits will also affect the H attacks that enemies can use.